Motorcycles! 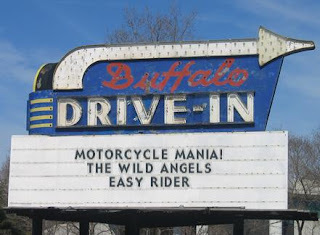 Be there any young virile man (or even some women) who hasn't dreamed of flying down the highway on a chopper, the wind flowing through his (or her hair) and experiencing the thrill that generations before have experienced, that of the feeling of total freedom? Marlon Brando, leather-jacketed and brimming with machismo asking the response to "What are you rebelling against, Johnny?"... "What'ya got?" 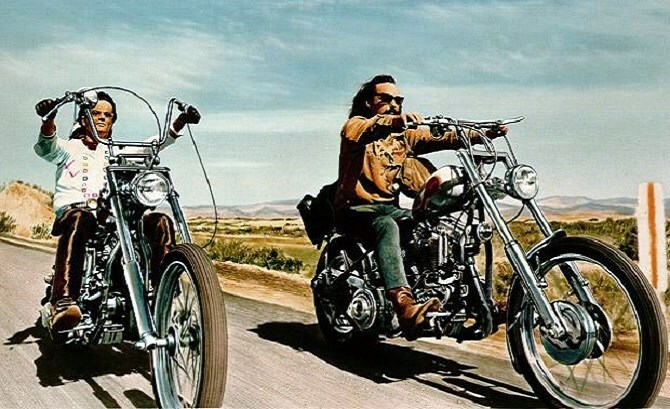 Hollywood has always had a love affair with motorcycles, but in the early days the riders were mostly outcasts and delinquents. Occasionally some good guy hero would appear on the scene who was also a biker, but the norm was to have the motorcycle seen as a threat to the staid community. 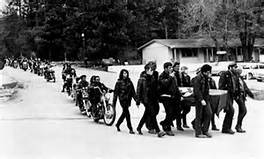 One of the weirdest of these was one called Werewolves on Wheels in which a motorcycle gang is cursed by a satanic cult. 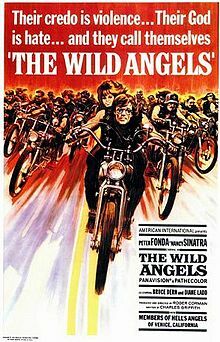 A movie from the King of the Drive-In, Roger Corman, The Wild Angels apparently had the blessing of Hell's Angels MC because they are acknowledged in the opening credits. Which may or may not be surprising, since the motorcycle club in the movie is not cast in a particularly good light. 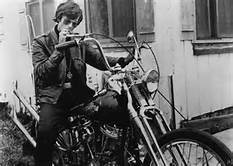 The movie begins with Peter Fonda (named "Blues" in the movie) arrives at the work place of a fellow biker "The Loser (Bruce Dern) to tell him they have figured out where his, Dern's, stolen bike ended up. 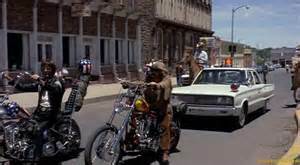 The biker gang, a fictional club of the real Hell's Angels, all ride out to the town where a group of Mexicans are running a chopper shop. Apparently an illegal "chop shop", to boot, because the gang finds evidence of The Loser's chopped bike and proceed to kick some culo. But the police arrive en masse so the gang makes their getaway. But Loser hijacks one of the police motorcycles. In the ensuing chase he is shot in the back by a cop and is captured. Meanwhile back at the club, everyone is worried about the Loser. Some of the worry is over his health, but a majority is over what will happen to him when he is back to health and then prosecuted for his crimes. So an elaborate plan is hatched to rescue Loser from the hospital. But not being doctors, or even halfway aware of the negative consequences, they only manage to get him free to watch him die. An all-out party happens again at the funeral when the preacher at the church decides to use the format to preach a half-hearted sermon, which of course is not well-received by the gang members. They knock out the preacher and break out the liquor and destroy the church. After which they go to bury the Loser in the cemetery. But the locals cause a ruckus, and the Angels being what they are join in a melee. Roger Corman delivers a very exciting piece here, like most of his movies on a rather limited budget. (He made this one for about $350K). There's not much plot, but there is some decent Corman violence, and Fonda shows some promise in one of his early film roles. 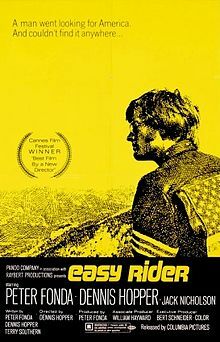 This role is a bit edgier than that of Wyatt/Captain America in Easy Rider (reviewed below) but Fonda still shines through. Diane Ladd, who was Bruce Dern's real life wife is good as the Loser's wife here. And it's easy to see why Nancy Sinatra didn't go very far as an actress. A mannequin could have been her stand-in and no one would have noticed. This is it folks. 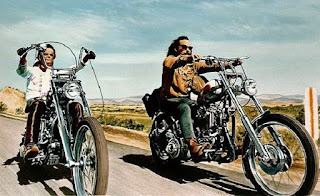 The iconic movie that made Peter Fonda, Dennis Hopper and even Jack Nicholson stars. 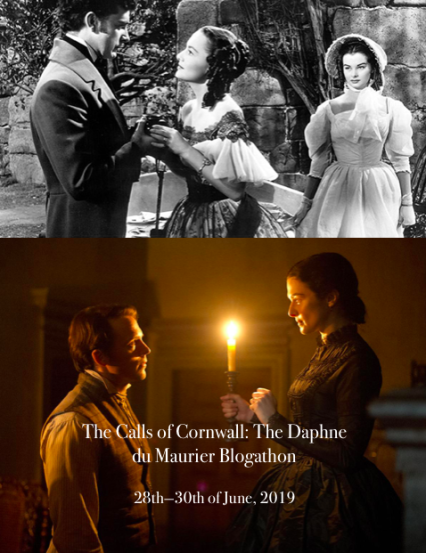 It was also a turning point in film, moving away from the syrupy movies that preceded it to the harder edged stuff that came after. 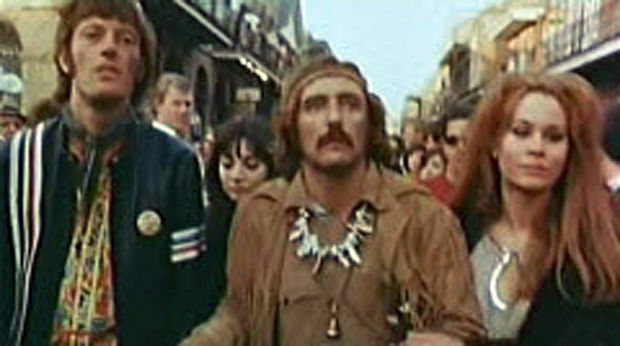 The film has been called a touchstone of the counter culture. 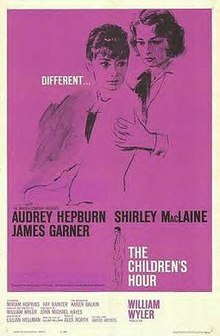 It shows a contrast between the staid old school outlook of the 50's and before to the new oncoming viewpoint that the 60's produced, both on the news and life scene as well as in the movies. 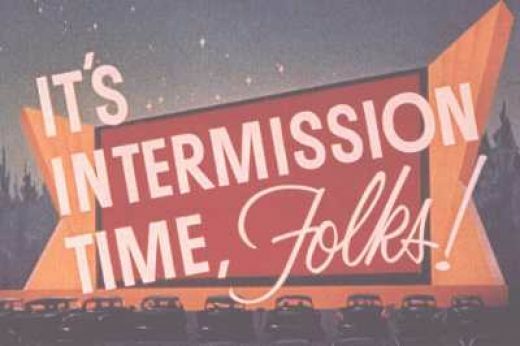 The movie begins with a drug deal. We are introduced to the two main characters Billy (Hopper) and Wyatt aka "Captain America" (Fonda). 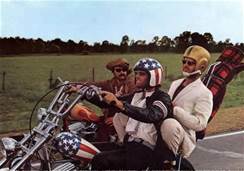 Fonda is called Captain America at points in the movie mostly because of his American flag inspired helmet and motorcycle. The two complete the deal with the Mexican drug dealer and the scene shifts to them selling the same stash to a limo-driven big wig. Having made the sale, they stuff the money in a tube and hide it in Wyatt's gas tank. THe movie shifts at this point to their journey to go see Mardi Gras in New Orleans. Along the way, they pick up a hitchhiker who is going to his commune. 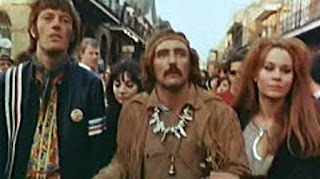 The two stay for a day in the commune, and we get to see life as it was attempted by uneducated hippies who had an ideal but no clue how to achieve it. The hippies are barely surviving, but most of them seem to accept the consequences of their fate. 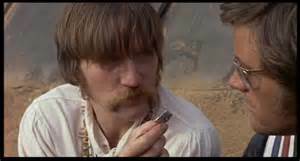 As Billy and Wyatt are leaving, the hitchhiker gives them some LSD telling them to use it when the time is right. Back on the road, the two are going through a town which appears to be having a parade. Billy and Wyatt goofily join the parade but are arrested for "parading without a permit", which sounds to my ears like being arrested for having long hair, but they end up in jail, anyway. They end up in a jail cell with George (Nicholson), who is in there because he is basically the town drunk. George offers his help in getting them out of jasil and asks them if he can go with them "You got a helmet?" "Oh, I got a helmet"
They continue on their journey, but in another town encounter hostility and ridicule when they try to eat at a diner. They leave and camp out, but some of those hostile townfolks drop by for "batting practice", beating them with baseball bats. Wyatt and Billy come away with a few injuries, but George is killed. They vow to take George's stuff to his folks. The Mardi Gras scene is very unusual for the time, although not so much today. 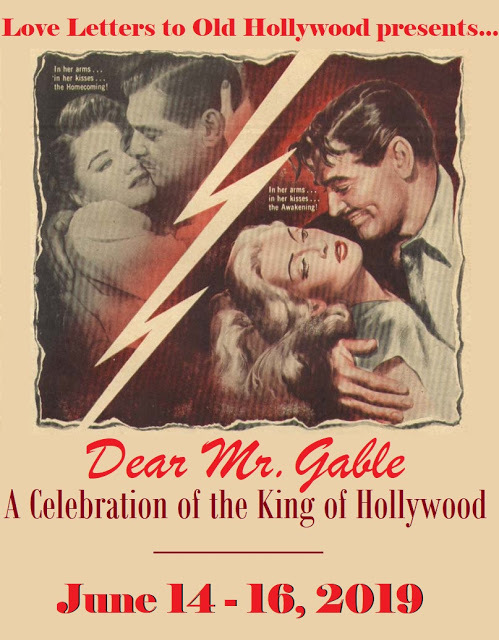 The two go to a brothel that George had mentioned They get a couple of girls, but instead of making hay, they decide to go out to Mardi Gras. In a cemetery, they share the LSD given to them by the hitchhiker earlier. This leads to the bizarre scenes that highlight the buzz/trip on which the LSD takes them. On the road, the two encounter a pickup with a couple of rednecks. 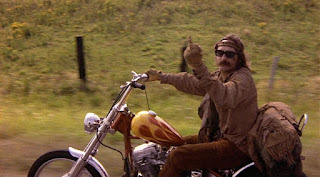 One of them points a rifle at Billy, threatening him, and, as Billy shoots them the finger, ends up shooting him. The truck takes off at Wyatt turns back. Finding Billy still alive, he tells Billy he will go for help and races off. Meanwhile the rednecks turn back and shoot Wyatt, exploding his gas tank, as the credits roll. 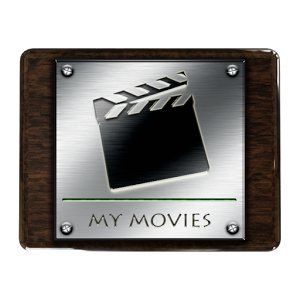 There is much about this movie that is worthy of watching. As a looking glass look into the counter culture of the 60's and how society perceived them, it is excellent. It may even have something profound to reveal to today's counter culture movement. If nothing else, it's worth a look to see Fonda and Hopper and Nicholson in the early stages of their careers. That's it from the backseat of the Plymouth Fury this time, folks. 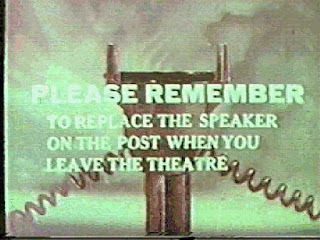 Be sure to buckle up when you leave the theater.